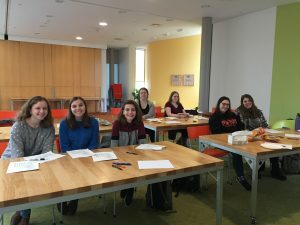 First-year Sarah Biskowitz is leading an impressive initiative: religious learning workshops for Jewish-identified Smithies! Even though Sarah has only been here for a semester, she is already establishing strong roots in the community. Assisting Hebrew school teacher Emily Brocks, a mentor of hers, Sarah teaches Hebrew prayers to 4th and 5th graders at Congregation B’nai Israel in Northampton. She is also on the board of SCJC, the Smith College Jewish Community. Sarah is bringing many of the tools she uses at B’nai Israel back to campus, where she is leading a three-part series of “Shabbes Schmooze and Learn the Basics” workshops, providing introductory education in Judaism and Jewish practices on Saturday afternoons. The first session was February 17; the next meetings will be on February 24 and March 3, 2-3pm in CC103/104. When I arrived to the first workshop in Sarah’s series, she was teaching the Hebrew alphabet to a group of students through song. Sarah had printed copies of a practice packet so each student could work on writing letters throughout the lesson. “Learning a new alphabet is like learning a code, it’s so good for your brain!” she exclaimed. Her smile was present throughout the meeting and her passion was evident. “Jewish spaces at colleges often cater to to Jewish students that have a certain degree of education in Judaism,” she told me after the meeting. The Jewish people have rich cultural and linguistic traditions and 3,500+ years of history spanning the globe. However, not all Jewish-identified people received comprehensive religious teachings growing up—perhaps if they’re from multi-faith or secular families. These Jewish-identified students can feel left out of Jewish spaces. Sarah wants to challenge that aspect of Jewish student communities and create a space where all are supported and encouraged to learn. While Sarah’s lessons are geared towards Jewish-identified students, all are welcome! There is a story in Jewish lore about rabbis putting honey on letters of the alef-bet while children begin to learn the Torah. The children are to happily lick off the honey and associate the Torah with sweetness. Sarah echoed this sentiment in her lessons, assuring her peers to not be overwhelmed, but rather to enjoy getting a “sweet taste” of Jewish learning! Sarah shared this cultural tidbit with me, saying “it is never too late to learn, and never too early to develop passion.” Join Sarah and fellow Smithies February 24th to learn more about the basics of Jewish culture and religion. The following week, on March 3rd, Sarah will be teaching basic prayers for Shabbat. After this series is over, SCJC plans to continue to host Saturday afternoon activities including discussions and skill shares. This entry was posted in Programs & Events, Student Articles, Student Orgs and tagged campus news, identity, Jewish, Shabbat, Smith College Jewish Community. Bookmark the permalink.